Student Volunteers and Community Partners Get Pride Elementary Walking to School! At Pride Elementary in New Tampa, students take the lead in their own Sidewalk Stompers walk to school program. When Pride students prowl into school in the morning on foot or on bike, 5th grade “student ambassadors” welcome them. Each ambassador carries a clipboard listing K-5 students who regularly commute to school walking or biking. They are responsible for counting all of the “active transportation” students and tracking that data in a spreadsheet. Pride Student Ambassadors checking in classmates walking to school. “Our Student Ambassador Program has provided student voice and student input to help make suggestions and improvements at Pride, as well as increasing our community partnerships,” said Pride teacher Raquel Gomez-Johnson. Ms. Johnson started the program this school year. With the November launch of the Sidewalk Stompers program at Pride, arriving students know by now to check in with these ambassadors every day before heading into class. And they know why: at the end of each week, another class will be selected to win the Golden Sneaker Award! Principal Amy Zilbar created the trophy – a gold sneaker mounted on a stand – with the help of a local trophy store to add a little shine to the project. When she walks through the school carrying that trophy, students excitedly stop her to ask... who is this week's winner? Principal Zilbar presenting the Golden Sneaker Award. More prizes are on the way to reward this energetic example of student involvement in kids' health and wellbeing. Last month, we stopped by the Pride morning show with AdventHealth Tampa to announce a new partnership between the hospital group and Pride Elementary's Sidewalk Stompers program. Thanks to AdventHealth, walking and biking students who check in with their student ambassadors will be winning pencils, frisbees, water bottles, and more. And the classes with the most walkers will be winning baskets of outdoor play equipment to use at recess. 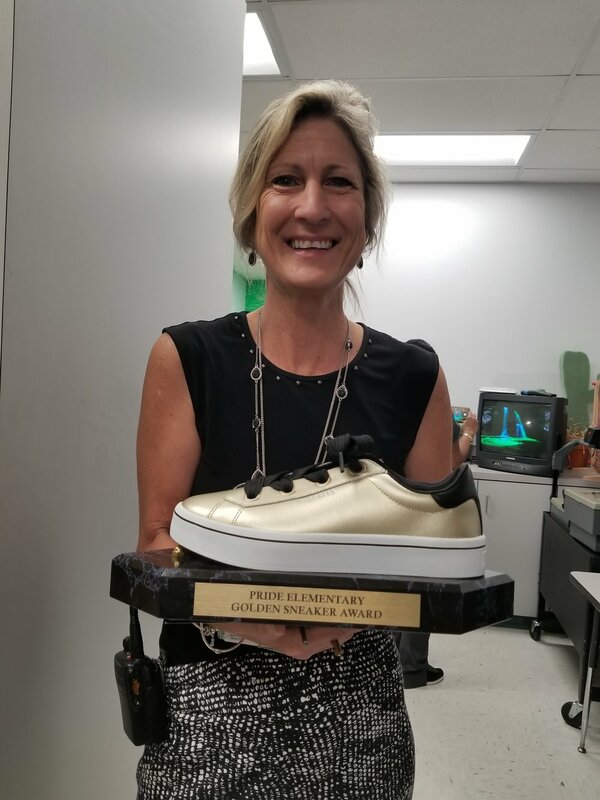 “Advent Health has supported Pride Elementary from the inception of our Sidewalk Stompers Program and their partnership has resulted in more student participation, as they are motivated to earn the weekly ‘Golden Sneaker’ trophy or other prizes for their classrooms,” said Principal Zilbar. Keeping your body active and getting involved with your community is what Sidewalk Stompers is all about. We are so proud of Pride’s student ambassadors, leading the way to promote healthy walks and bike rides to school. Principal Zilbar, Sidewalk Stompers president Emily Hinsdale, and AdventHealth Tampa’s Jen Bradley and Roxanne Carlucci announcing their partnership on the Pride morning show in March.